Now I’m not the best cook in the world, I’ve still got a million things to learn but sometimes I nail it. You know when you cook something so good that you wish you had some people there to try it? Maybe if they were they might have left extremely happy and content, having eaten something so good they would have a feeling they could change the world for the better? Well tonight was one of those occasions. 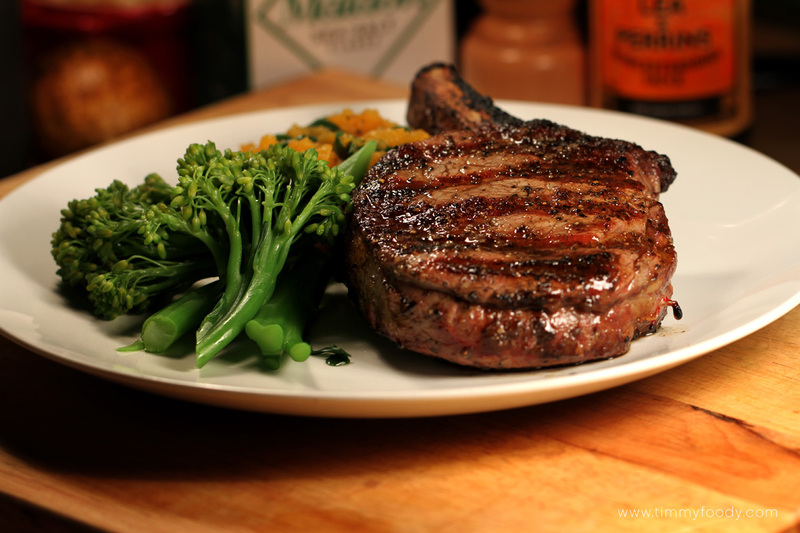 I recently acquired some rib eye steaks from Millins Fine Food butchers. A really great place located in Balgowlah Heights in Sydney. These steaks are absolutely sublime. Grass Fed, 8 week aged. The texture, the flavour and the amazing butteriness you get from this beef is amazing. Tonight I wanted to just make something simple. Not over complicate it and not do too much with the beef. The main thing would be the sauce and cooking the steak as well as I could. So I made some really simple sweet potato mash with spinach. Some steamed brocolini and a really great red wine sauce. It may have even been a Jus but I’m not sure what that is. I think it’s just a thin gravy. I could google it I suppose but I reckon if you want to call it a Jus you call it a Jus. I’ll call it a banging gravy. Ok so I’ll split this into three parts. Try and do all this simultaneously if you can. Get the sweet potato on the boil then do the sauce. We’ll do the steak near the end. Make sure to remove the steak from the fridge at least an hour before you cook it. Cooking a steak and indeed any meat straight from the fridge is the worst thing you can do. 1. Boil the Sweet Potato in Salted water until tender. Drain, add the olive oil, a pinch of salt, a few grinds of pepper and mash well. Not add the spinach and pop the lid on. The spinach will wilt in the residual heat from the mash. Put to one side. 2 cloves of garlic – peeled but left whole. Red wine. I used Pinot Noir because that’s all I had but the choice is yours. Spicy Tomato Relish – I use the Spicy tomato relish from Beerenberg. All their stuff is amazing. 1. Bring a pan to a medium High Heat. 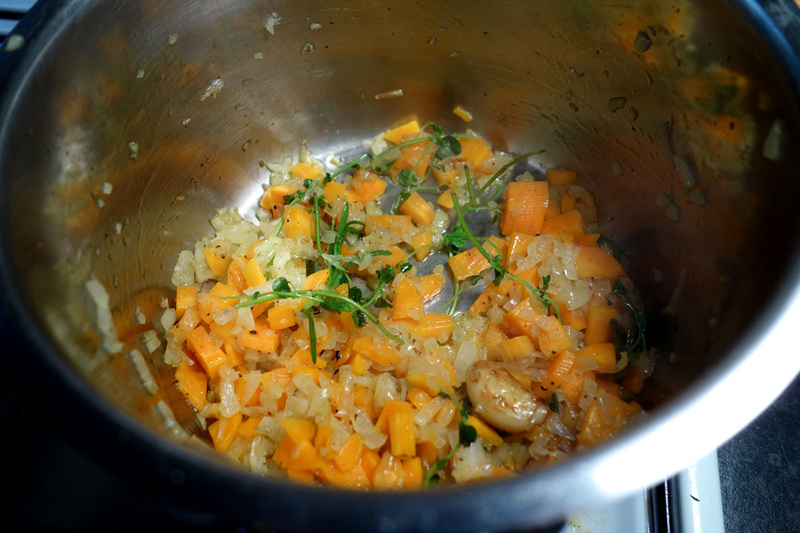 Add the Olive Oil then add the clove of garlic. Let them brown off slightly on all sides then add the onion and carrots. turn the heat down to a medium heat and Cook these off for about 5-8 mins. About half way through add the spring of rosemary and thyme. Cook until they the onions and carrots soften. 2. Now add a splash of Worcestershire sauce and 2 glasses of red wine. Bring up to a high heat and let this boil until it’s almost reduced. Maybe about 5 mins. Now add 1 cup of beef stock and a load of freshly ground pepper. Let this keep boiling until it reduces by about half. 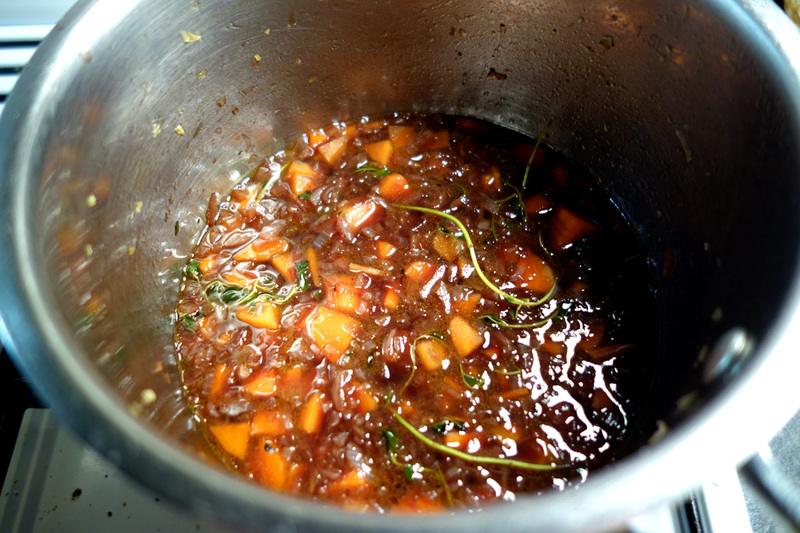 Now add 2 teaspoons of the spicy tomato relish and mix well. 3. This should now be ready. Strain through a fine mesh sieve and use a spoon to mush out all the awesome flavour into a jug or bowl and cover. 1. Get a BBQ or frying pan as hot as you can. I used my BBQ. It’s about 20 years old. Gas powered with a layer of the little ceramic bricks so you get a really nice even heat. It’s so good. I got this so hot that if you get within about 2 feet you instantly burst into flames. So as you can see you want it to be smoking hot. While this is heating up get the steak and drizzle with olive oil. Season with pepper on both sides. Don’t salt yet! 2. Pop the steak in the pan or the BBQ and let it brown on for 45 seconds. Turn and season the browned off side with Maldon salt and a touch more pepper. After 1 min turn again and season that side with salt and a touch more pepper. 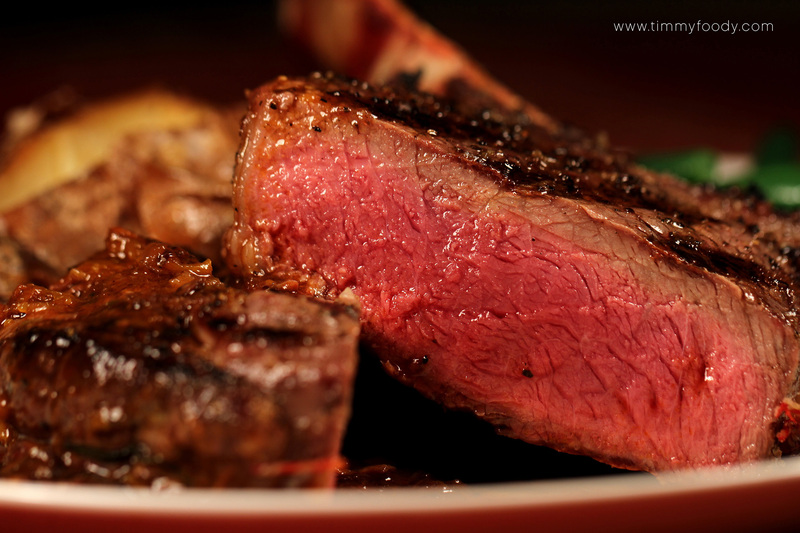 The time you want to cook this for will depend on how you like it cooked and how thick the steak is. I generally just use the force to tell if it’s ready. 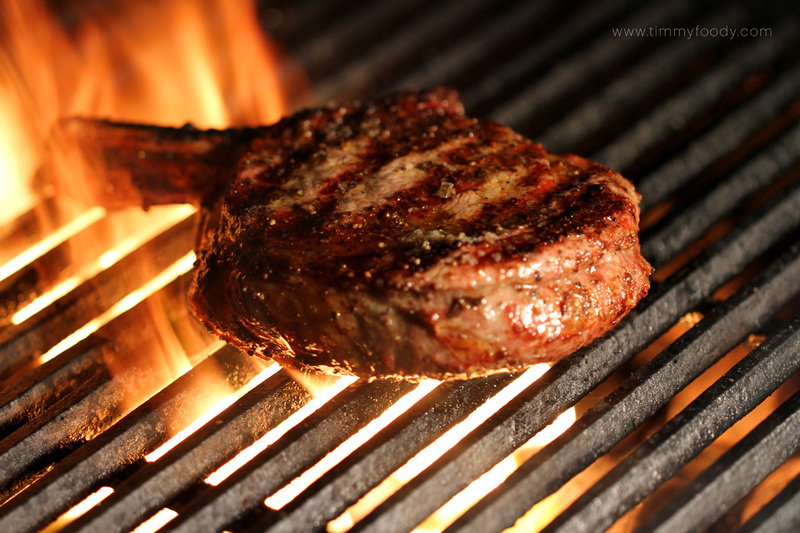 I cooked my steak for a further 2-3 mins each side, popping the lid down on the BBQ to generate a bit more heat. It was very thick and I wanted it rare so it worked out about right. As I cooked it on the BBQ I managed to get some amazing flame grilled flavour on the edges. Right at the end I brushed some olive oil on the steak just to get some flames around the beef for the last 30 seconds. 3. One you think the steak is ready remove from the heat and pop on a plate to rest. Cover with some foil or another plate. While this is resting you can steam your vegetables of choice. Serve on a plate with the mash, the vege and the steak. Pour over the gravy and eat away!